The DOBI Medical ComfortScan	system is an advanced digital-imaging system that uses high-intensity light-emitting diodes and gentle external pressure to highlight areas with vascular abnormalities. The DOBI Medical technology is based on detecting tumor angiogenesis, or vascular change, the process whereby a cancerous growth surrounds itself with a dense network of tiny blood-filled capillaries. These vascular "feeding tubes" provide oxygen and nutrients to active tumors and are unique physiological "markers" that reveal the presence of cancer. Angiogenesis is a natural occurrence in the body. In cases where cancer is involved, the growth of new blood vessels occurs around, and in support of, a tumor. When a woman discovers a lump within her breast, it has likely been developing for a number of years as cancerous tumors can often take many years to become palpable. 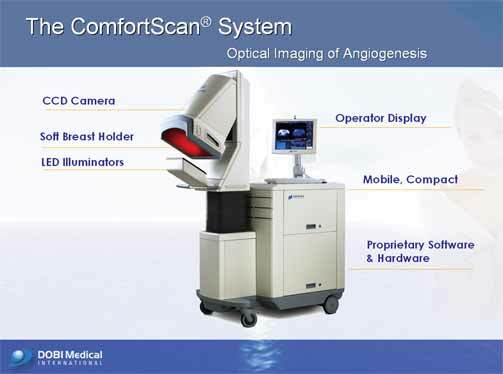 The ComfortScan system's high-intensity, light-emitting diodes transmit near-infrared light through the breast, recording several images per second via a CCD camera for approximately 45 seconds. If the light encounters an angiogenic (and potentially cancerous) region of the breast, it is absorbed differently than in other regions of the breast because of the different concentrations of hemoglobin. It accordingly appears on the ComfortScan system image in marked contrast to normal portions of the breast. As a result, the ComfortScan system focuses on dynamic functional imaging (i.e., what is occurring within the tissue in near real-time) rather than a singular morphological image (i.e., a static, anatomical snapshot showing physical details at a single point in time) such as those created by mammography. These unprecedented images could provide the physician with new, physiological information which may be associated with angiogenesis which relates to cancer development. The initial application of the ComfortScan system is as an adjunct to mammography and physical exam. The ComfortScan system may have the potential to increase screening sensitivity when used in conjunction with mammography. The ComfortScan system has the potential to provide many improvements over currently available imaging technologies in the areas of accuracy, speed, comfort, safety, convenience, ease of use, and system and scan costs. The Company has consciously selected this initial use for the technology because 1) breast cancer is the most prevalent type of cancer with the highest amount of evidence for angiogenesis-dependency; 2) there is a significant market need; and 3) a shorter, less expensive timeframe to FDA approval is anticipated for an adjunctive device.